I'm actually really stoked on how this site is coming along. I have a few issues with the pink login module and the blue More Articles module not loading correctly on some pages, but overall I'm really happy with how things are coming together. In particular I have been working hard on the mobile versions of the site a lot lately. I sooo love all of the background images on the home page and how perfectly they convey where I've come from and what I'm doing with Qustom. And at 1920x1200 on my Mac, they look brilliant. I find these images to be so key to the site's overall look and feel that I'm working on different size background images for each common screen resolution out there. For now I hope everyone can get a chance to view the site on a large computer screen, or at least a high resolution tablet. The first background image on the home page speaks to the synthesis of two loves of my life better than any I could imagine. The late '70s through mid '80s were such a magical time for so many of us. It seems that nearly every time SoCal's mods, punks, NewRo's, rockabillys, and whatnot got together for a scooter rally, it went straight to the coast and then north or south, no matter what the starting point. Ski Beach. Carlsbad State Beach. Sunset Cliffs. Redondo Beach. Mailibu. Coronado. Laguna. Newport. Long Beach. San Luis Obispo. Poseurs were shunned and derided like the plague, but they were few and far between anyhow. Mostly it was great times. And there were some great coastal music venues - The Roxy Theater and Headquarters in PB, Club Zu in Encinitas, Fenders Ballroom in Long Beach, and many others in coastal OC that skip my mind at the moment. 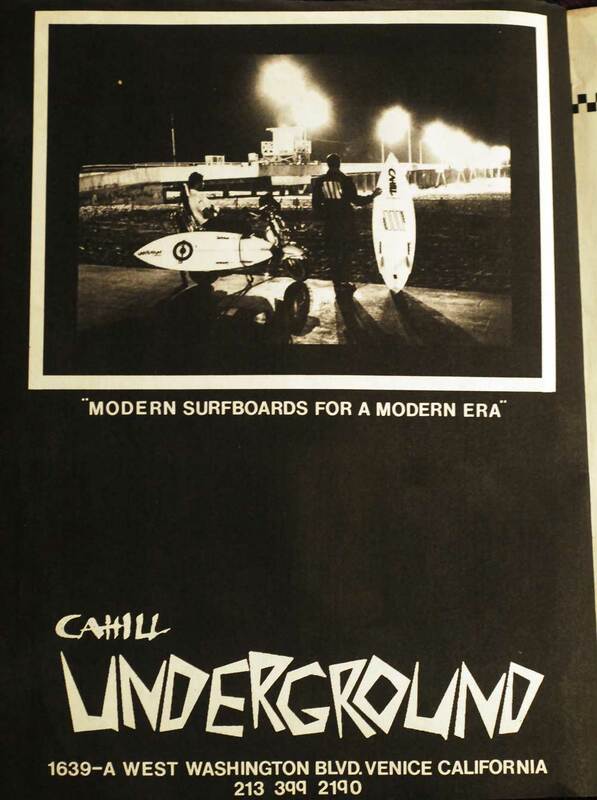 And yeah, though I didn't surf at the time, I was well aware of the deep roots that San Diego and surfing share. I conveyed this in my advertisements with WCLW by playing up the southern California theme, and also our through our logo with the palm trees in the background. Even the paint schemes on our race bikes came to be known as "seaweed". Get prepared for some new "seaweed" motifs on Qustom surfboards in the near future! The WCLW Team Visits the Innocenti Factory? 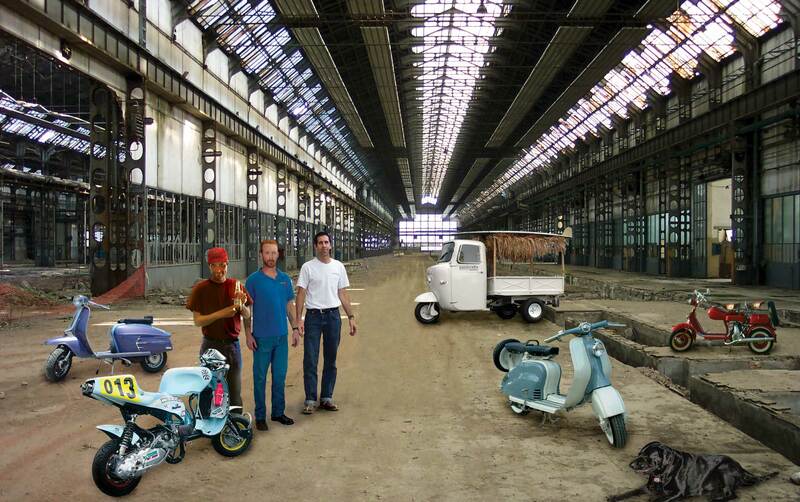 The WCLW Team in the Innocenti Factory? The second background image is one of my all time faves. It started as a photo of me from 2003 standing in the barren remains of the Innocenti factory on the outskirts of Milan, Italy. After many, many hours with keyboard and mouse I was able to create a whole new scene that included both of my brothers: our shipping manager Brendan and our webmaster Sean, along with many of our favorite Lambrettas and even our shop mascot, Norton. This image was a huge hit in several magazine ads as well as the WCLW catalogue. I still laugh at how many people actually believed the caption I jokingly added below it in the catalogue that went something like "The WCLW crew gather in the warehouse for a photo shoot"... Actually our workspace was just a tad smaller than that! The last background image on the home page may just be my favorite surf photo that I've ever shot. 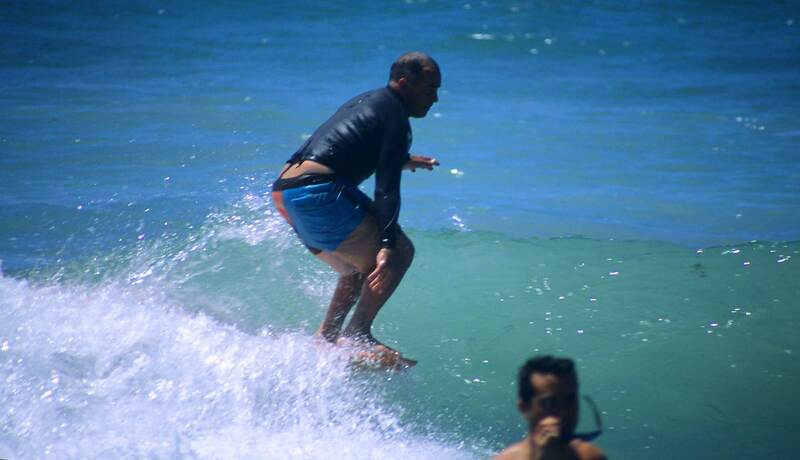 It's a picture perfect San Diego day, and there's Herb Bradley flying along on a left at the Pumphouse, perched solidly on the nose, slightly crouched to make a high speed section, left hand reaching out for the lip, intense and insanely casual all at once... and meanwhile some dude who looks just like Gregg Maddux is putting his sunglasses on while walking away from shore at exactly the wrong time to take in this bitchen scene. It reminds me of a scene from one of my favorite surf flicks, Waves of Change. I have written a ton about this one particular scene elsewhere (including here and here), but suffice it to say that as the action reaches a crescendo, there is a quick cut to this OH* slouched on the shore, his bearded gourd planted up to his ears in a newspaper, completely oblvious to the insane action going on right in front of him.